Cute as a Button Ladybug Nursery Decorating Ideas. All the Baby Room Decorations, Nursery Pictures and Ideas You Need to Create a Beautiful Ladybug Nursery! Bring the promise of springtime into your baby nursery with the ladybug nursery theme decorating ideas on this page. Ladybugs are a popular and playful choice for your little girl's nursery. These little critters will captivate and delight her for years to come. There are so many ways to twist this baby nursery theme, from fairy circles and toadstools to garden flowers and picket fences. You'll find plenty of nursery decorating ideas on this page to help you with creating a ladybug baby nursery that your little one will love! You'll also find enchanting inspiration in the wide range of ladybug baby room decorations available on the market. From whimsical wall art to ladybug drawer knobs, you'll find everything you need to decorate your ladybug nursery at our Ladybug Nursery Theme Store. 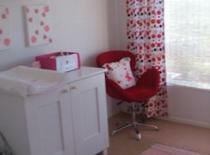 If you are decorating a ladybug theme nursery enter it in our baby nursery photos contest here. You could win a great prize and we will add your nursery to this page to inspire other moms! Pastel pink or lilac with sage or lime green. Hot pink and chocolate brown or black. White with hints of red for a vintage ladybug nursery. White, red and black for a gorgeous modern approach. Try cutting poster board into strips and painting it glossy white to create a picket fence or a lattice work around the bottom of your baby nursery walls. A ladybug nursery theme is perfect for a vintage nursery. Use lots of crisp white linens mixed with red and white gingham. Embroider cute as a button little ladybugs across a corner of the bedding or around the crib bumper. Look for a vintage ladybug tea set, old ladybug posters and wooden ladybugs. Then scatter a few red and black accents around the room. If you want to go for a cartoon type ladybug theme, you can base it on the characters from Disney's "A Bug's Life". What a cute and colorful nursery theme! 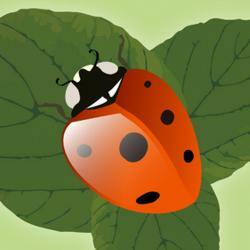 Ladybugs are also a great choice for a contemporary nursery. White walls with bursts of black and red around the room will create a gorgeous modern look. Add some red polka dots of different sizes and set the ladybugs among them. Stencil little ladybugs on the crib and dresser. You could also use ladybug decals or little wooden ladybugs. Look for ladybug drawer pulls to add to your dresser. Make or buy wooden name letters in black, red and white. Polka dots and gingham patterns work well together. Add a wooden ladybug or two. Create a fairy garden nursery with a bird bath, picket fence, flowers and lots of winged creatures like butterflies and dragonflies. Scatter your ladybugs among the flowers or hang them from the ceiling on varying lengths of transparent twine to create a 3-dimensional feel. Another idea is to concentrate on ladybugs and flowers. Paint your flowers and their leaves around the nursery walls and add your ladybugs. They can be flying from flower to flower or lounging in an upturned leaf or on a daisy tuft. Or spin it a different way and paint the lower half of your walls dark green to look like grass and have ladybugs flying through the sky on the top half of the walls with cotton clouds above. If you are having a belly cast made you could decorate it to look like a ladybug, or leave it white and just have a procession of small button ladybugs walking across it. Add this saying to your nursery walls - weave it in amongst the clouds: "With a butterfly kiss and a ladybug hug, sleep tight little one like a bug in a rug." Why not make your own ladybug baby room decorations? You can use red and black cardstock with black pipe cleaners for the legs. Or use salt dough. Bake ladybug shapes and decorate them with acrylic paint. Nothing could be simpler. Add a few children's storybooks with a ladybug theme to your baby's bookshelf. You can spend many delightful hours reading them together as your child grows. Don't forget to add a cute and cuddly ladybug plush toy. Don't forget to look for garden theme nursery decor as well and make sure you search other home decor departments too. You'll find gorgeous ladybug teapots, planters and much more that will be a perfect addition for your ladybug nursery.